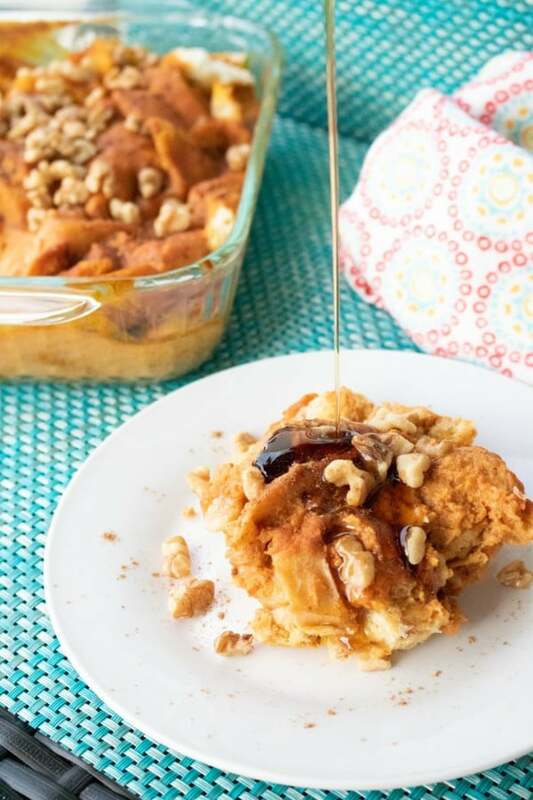 This Overnight Pumpkin French Toast is the perfect, worry-free breakfast for Fall mornings. Just prep everything the night before and start the morning with a mouthwatering, satisfying breakfast. We love to host our friends and family, especially when we get to enjoy their company for a few days. And when we are lucky enough to have overnight guests, I like to spend as much time with them as possible. Since I also don’t want them to starve, I try to come up with dishes that I can make ahead of time and just pop in the oven. 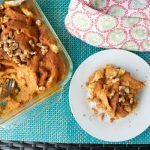 This Overnight Pumpkin French Toast is always a crowd-pleaser and is one of my favorites to serve during autumn. 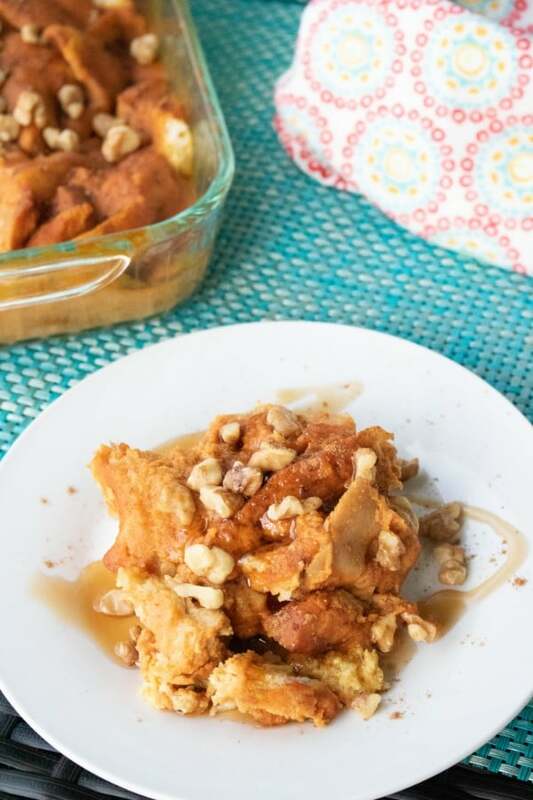 Aside from how amazing it smells and how delicious it tastes, my favorite thing about this Overnight Pumpkin French Toast is how easy it is to make! 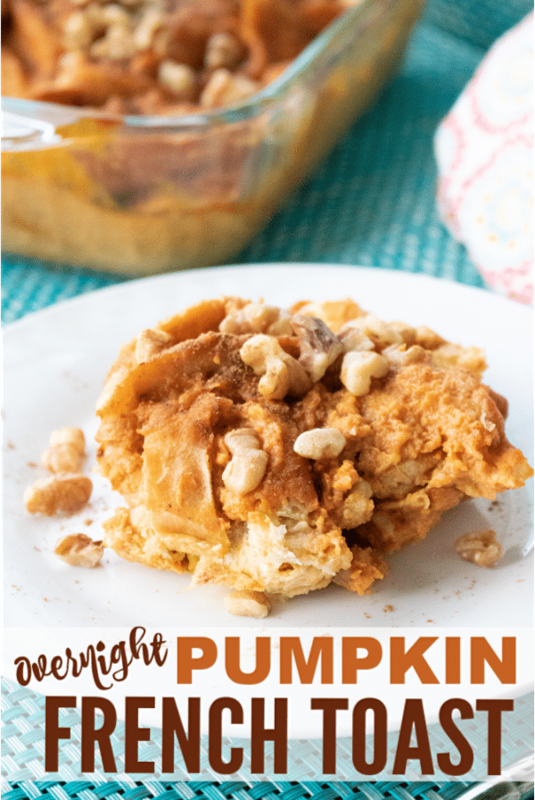 To start, you’ll mix together 1/4 cup of brown sugar, a teaspoon of pumpkin pie spice, 4 eggs, and 2/3 cup evaporated milk (NOT sweetened condensed milk). You’ll still have a little more than half a can of evaporated milk left. If you’re wondering what to do with it, check out these uses for leftover evaporated milk. 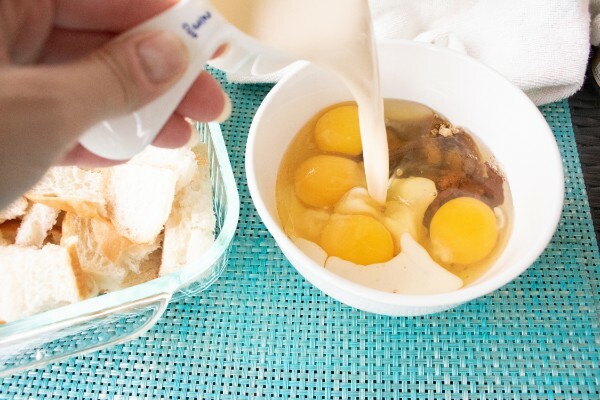 Use a fork to break up the eggs and mix the ingredients together. Now it’s time to add the canned pumpkin. Pour in the entire contents of a 15-ounce can. 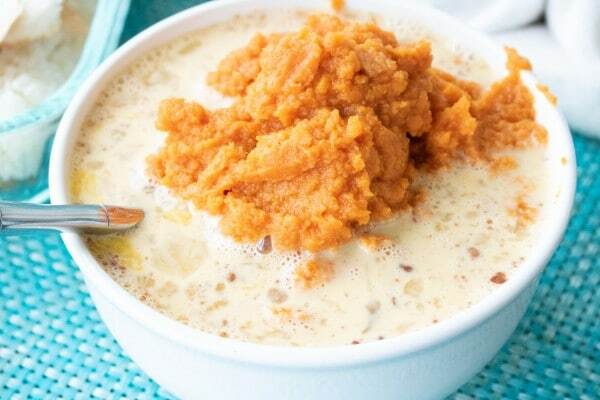 Stir until the pumpkin is fully incorporated into the egg mixture. 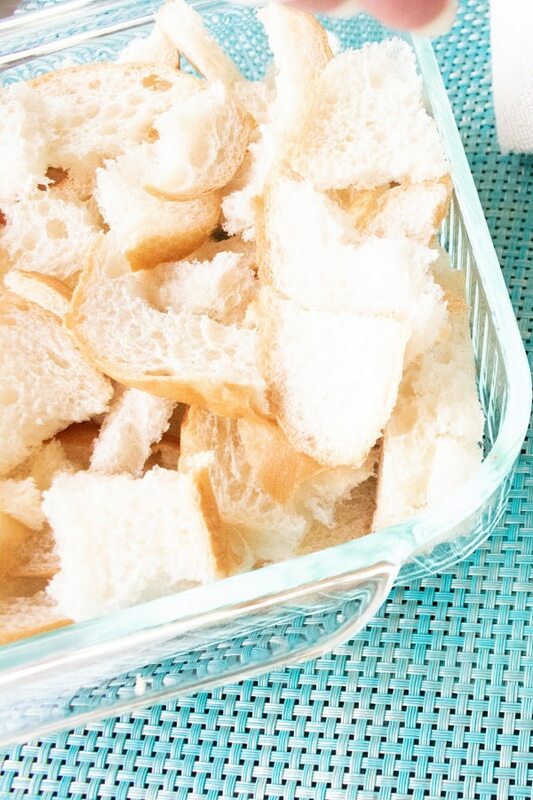 In a 9×13 inch baking dish, arrange an even layer of bread cubes. If you want, you can use day-old French or Italian bread. It will sit in liquid overnight and will end up moist and delicious anyway. 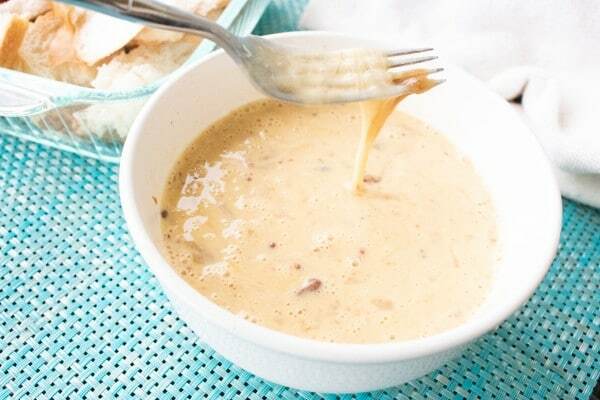 Pour the pumpkin mixture over the bread cubes. Cover and refrigerate until you’re ready to bake it. If you aren’t planning to bake it within the next 24 hours, you can freeze it. Just transfer it to the refrigerator to thaw the day before you plan to bake it. 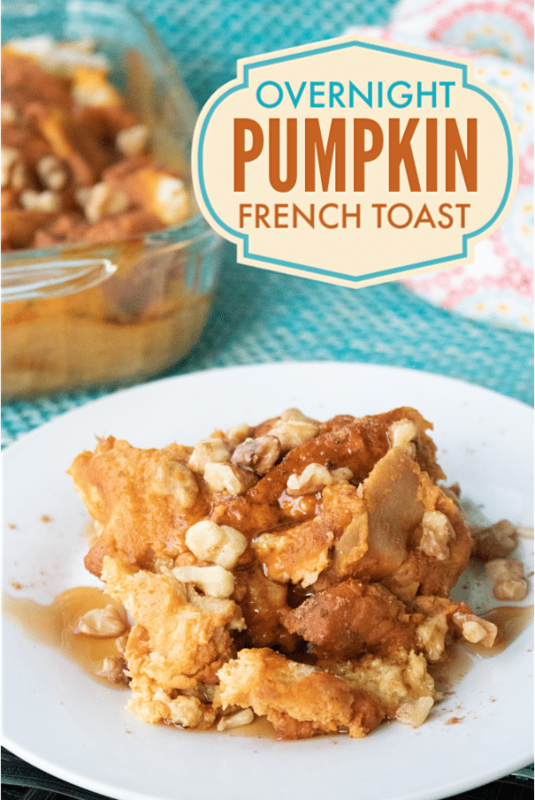 When you are ready to bake your Overnight Pumpkin French Toast, remove it from the refrigerator and place it directly into a cold oven. Set the heat to 350 degrees. Bake for 35 minutes after the oven reaches temperature (give or take a few minutes depending on how quickly your oven heats up). When the casserole is cooked through, remove from the oven and serve immediately. It’s best when it’s warm! Mix together brown sugar, pumpkin pie spice, eggs and milk. Stir in pumpkin until well incorporated. 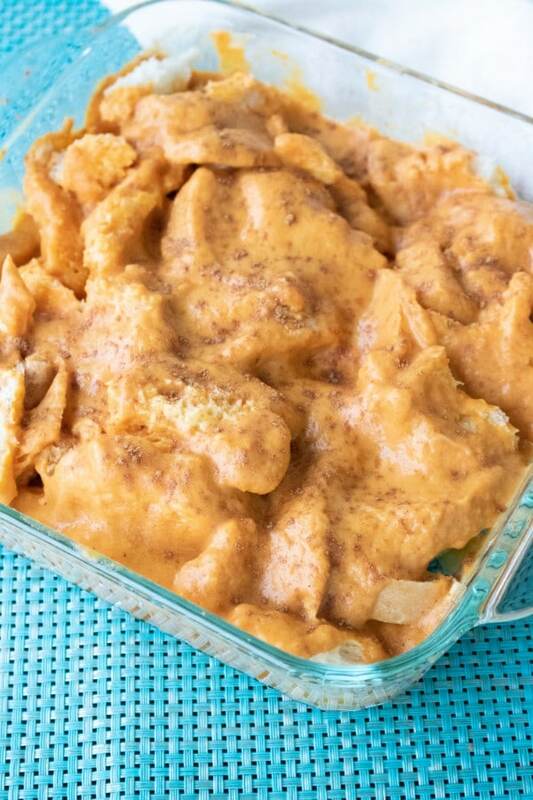 Add bread pieces to a large oven-safe casserole (13x9 is good) and pour pumpkin/egg mixture over the bread. Cover and refrigerate overnight.